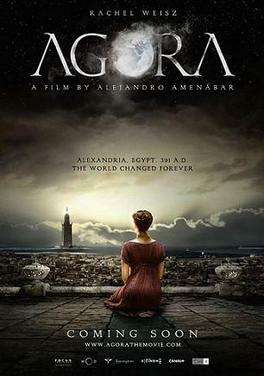 A promotional poster for the 2009 film Agora about the life of Hypatia of Alexandria (c. 370-415 CE). Based on Wikipedia content that has been reviewed, edited, and republished. Original image by Focus Features. Uploaded by Mark Cartwright, published on 16 February 2014 under the following license: Copyright, fair use. This content is protected by copyright. We believe that this reproduction constitutes fair use because: it is published for non-commercial educational purposes; no public domain copies are available of this material; only a small section of the work is reproduced in inferior quality; and this reproduction will not reduce the market for or value of the original work in any way. Please note that content linked from this page may have different licensing terms. Features, Focus. "Agora Film Poster." Ancient History Encyclopedia. Last modified February 16, 2014. https://www.ancient.eu/image/2313/. Features, Focus. "Agora Film Poster." Ancient History Encyclopedia. Ancient History Encyclopedia, 16 Feb 2014. Web. 24 Apr 2019.